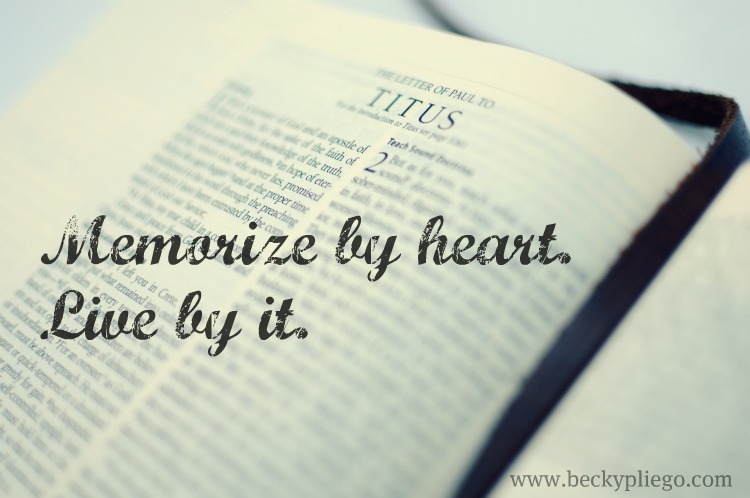 How are you doing with this week’s memory verses? I must admit that for me it has not been easy. Normally the opening and greeting in the epistles are somehow easy to memorize; but this one has been tougher. Now see this beauty, the faith of God’s elect and their knowledge of the Truth (yes, we must have knowledge of the truth, we must study the Word) accord with godliness. They go hand in hand with godliness, not with arrogance and a prideful heart, but with godliness. When you meditate on these words, one by one, you see this, and let me share with you that the Holy Spirit has convicted me in some areas of my life in which I have professed to have the faith, and I certainly have the knowledge but clearly lack godliness. The saints can persevere in godliness because of the hope of eternal life which God, who never lies, promised before the ages began. Do you see this? WOW! I get all excited when I read these words. We are not hopeless, we don’t desperately mourn the loss of those whom we love and have gone to be with the Lord, because of this hope. We can live like many saints have lived before us, without fearing death, because of this hope. We have hope of eternal life. God’s elect have hope in the eternal life He has promised. And He never lies. Now verse 3 tells us the incredible way God has chosen to make known his Word, and that is through the preaching of it. I pray God will give me a heart that burns within in me to preach the gospel to those who have not heard it. I fear that sometimes I am more worried to have a sound doctrine -and defend it- than to reach for those who have not heard the gospel yet. Grace: what makes this word so special is that there is another one on the other side: guilty. We can not be amazed by God’s grace if it were not because He has taken away all guilt and sin from us. Peace: True peace is only found when Grace has met us. First comes grace, then peace, in that order. 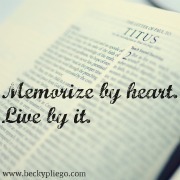 This entry was posted in Memorization, Titus by Becky Pliego. Bookmark the permalink. This post was timely for me. God's Word is incredible! Thank you for sharing. Thank you for sharing your insights! I hope to share some of mine on my blog tonight or tomorrow. I too am struggling with the memorizing a bit. It's the most I've ever memorized at one time!! I am nearly 49 and have memorized oodles of verses by singing them to familiar tunes. My memory works better that way these days. I will persevere, though–there is so much eternal gain to doing so.